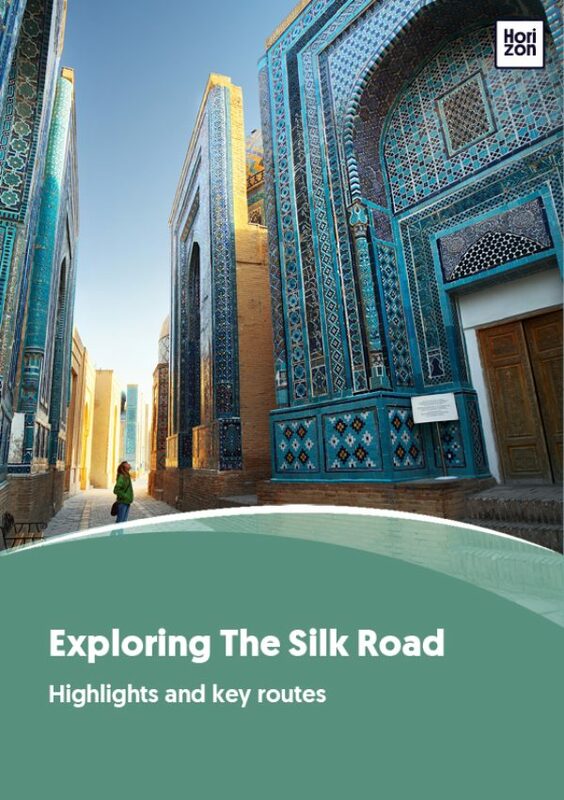 Less popular than the shorter Uzbekistan loop (px), this itinerary combines a visit to the historical heritage of Persian Central Asia with a look behind the curtains of a secretive country that few people know anything about. While Uzbekistan is well-known for its history, few people realize current-day Turkmenistan also played an important role in the history of the Persian empires that ruled Central Asia for three millennia. Seeing the masterful brickwork strewn across the Karakum desert will make you understand at once the continuity between the ages. In the age of over-tourism, visiting Turkmenistan is a singular experience. Less visited than Antarctica, you can be certain of a warm welcome from the Turkmen people. A number of surreal sights like the Darwaza gas crater and the marble extravaganza of Ashgabat are the cherry on the cake of a true once-in-a-lifetime trip. In short, this is an itinerary for those who are looking for the edge. If you feel the traditional loop around the highlights of Uzbekistan is missing some spice, a visit to Turkmenistan will certainly add the necessary flavour. Tashkent is the start and finish of this tour. The Tashkent metro has Central Asia’s most extensive network. You should not miss this underground experience: each metro station has its own theme, and some stations are as elaborate as those of the famous Moscow metro. Every tour to Uzbekistan will feature Samarkand’s monuments like the Registan and Shah-i-Zinda, but the city has more to offer. Paper-making is a craft that gets little attention among the splendour of Uzbekistan’s other artistic endeavors, but Samarkand’s paper museum is trying to change that. The museum traces down the history of paper from China to the Middle East and Europe, and shows the process as it is still being used today. Drinkers, on the other hand, might want to ask their guide for a detour to the Hovrenko wine factory to hear the story of viticulture in a Muslim country. The advantage of adding Turkmenistan to your Uzbek itinerary is that there is no need for the long and hot drive through the desert from Bukhara to Khiva. You take in Bukhara on the way back. Meanwhile, the kedang-edang of the overnight train from Samarkand lulls you to sleep. When you wake up, you are in Urgench, just a short drive away from Khiva. The slow, rolling hours of Soviet trains are the perfect opportunity to share a cucumber with an eager English student, or get snapped for a selfie by a mullah (older Uzbek men love getting their picture taken). An interesting side trip from Khiva takes in the desert fortresses of Khwarezm: impressive, lonely relics rising up from the barren floor. Make sure you have a knowledgeable guide who can bring the mounds to life by drawing the connection with the ruins across the border in Konye-Urgench. Although Turkmenistan has decent trains as well, a journey through the country will usually be by car. The main roads are of decent quality and tour operator vehicles are usually brand-new, making a drive through the desert rather more comfortable than it sounds. Konye-Urgench is just across the border from Khiva. What dazzles most about the site at Konye-Urgench is not the giant minaret left standing or the showpiece mausoleums, but rather, what is not there. The empty spaces in between the glorious monuments speak not of a town, not of a city, but of a medieval metropolis worthy of the name “Heart of Islam”. Tours will usually overnight in Dashoguz, a non-descript market town that does not show up in the guidebooks. However, its boulevards lined with enormous marble-clad hospitals, schools and government buildings are a stark contrast to Uzbekistan, offering a foretaste of Ashgabat’s urban fabric. The next day, camp out in the desert for Turkmenistan’s most famous sight, the Door to Hell. Although Buzzfeed-style blogs aimed at viral success have drenched the flaming crater with hyperbole, fact is, it’s still an amazing place to be. At night, in an empty desert with only the stars for company, red light emanates from the ground in the distance, and a distant rumble presages the crater. Shooting flames and fireballs across its undeep hole, like a volcano, the crater must be viewed at night for full effect. In the morning, wake up to a desert sunrise. It’s four more hours across the Karakum desert to Ashgabat. After a night of camping, you might want some luxury to compensate. Ashgabat provides this, in abundance, at the Oguzkent hotel, rivalling Almaty’s Ritz-Carlton as the best 5-star hotel in Central Asia. Although Turkmen cuisine is delicious and local kitchens surprise with their high standards, it isn’t very varied - many visitors are not used to that much mutton in their diet. International dining options in Ashgabat include Aziya, the go-to haunt for Ashgabat’s small Chinese expat community, and the Moroccan restaurant at Oguzkent (although that’s mutton again). Any visit to Turkmenistan is necessarily guided, but Ashgabat is a place where rules are more relaxed. Budget an extra day here to wander unaccompanied and do some souvenir shopping. Besides sheepskin hats and intricate carpets, Turkmens are also famous for their ornate jewelry and their cognac. All great gifts for your friends, or as a treat for yourself. Flights in Turkmenistan are quick, cheap and easy and most people opt to take a flight from Ashgabat to Merv. From the provincial capital of Mary, you will need a 4WD again to see the sights at nearby Merv. If Konye-Urgench is impressive, Merv bowls you over. The scale is immense, and the fantastic echo in the lonely mausoleum of Sultan Sanjar makes it clear: this was an advanced civilization, now buried in the dust. A fortress built for the ages, now inhabited by camels. Here, too, find Turkmenistan’s Sufi heritage seeping through the cracks. Pilgrims circle graves, three times, anti-clockwise. Mutter prayers, tie ribbons. Then invite you over to join in a massive feast (mutton again). After crossing the desert one last time, you say farewell to Turkmenistan and arrive once more in the hustle and bustle of Uzbekistan. Bukhara possesses the nation’s most atmospheric hammam. Wash off the Turkmen sand at Bozori Kord and treat yourself to the ginger-honey peel. To return home, you can take the new fast (four hour) train to Tashkent. Alternatively, take the slow overnight train for a second time round, and let the kedang-edang of metal on metal guide your meditation while you reminisce on a trip to remember.